I’m also noticing where mistakes are made. Actually, I’ve only found one mistake so far. It’s an expected mistake, reusing a pre-animated scene, but it’s disappointing to see considering the number of times the exact same sequence was reanimated to compensate for Sakura’s different outfits. This instance takes place in episode nine. The late afternoon begins innocent enough. Sakura, Tomoyo, and Rika are enjoying an after-school treat. Because they are indoors, they have taken off their shoes, and are wearing slippers. The girls proceed to try on the pins they bought earlier. Rika’s sword-design pin becomes a true sword, revealing itself to be a Clow Card. The Sword takes control of Rika. The hypnotized Rika chases Sakura out into the street. When Sakura dives and rolls to dodge an attack, her slippers slip off of her feet, leaving only her socks. Running out of options, Sakura unlocks the power of her key. Enter file footage. For a series with so many different copies of this scene, as Sakura is often seen wearing a different outfit each time, it’s amazing the staff would use the footage on file of Sakura in her school uniform for this scene—complete with her school shoes on! Were I Damien Kellis, I’d probably suggest the shoes are required to unlock the powers of the key, and because of this they appeared as an act of MAGIC. After unlocking the key, Sakura uses the Fly card, and she’s back to socks-only. 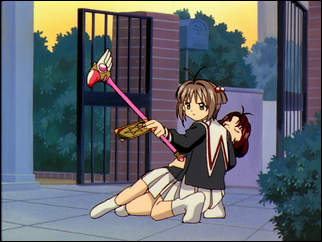 In a following scene, Sakura releases the Illusion. Unlike with the Fly card this episode, the entire release sequence is used for the Illusion. This time, the sequence shoes Sakura sans shoes. 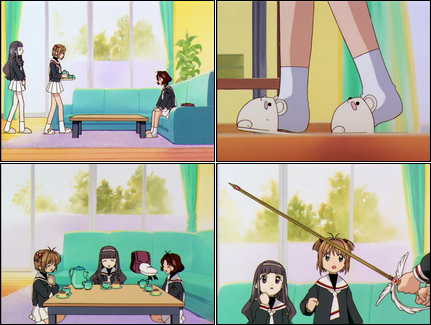 However, the true flub here is the bottom of Sakura’s socks after the confrontation is over. She’s been running around on the sidewalk and on the street, and her socks are perfectly clean on the bottom. Is this another case of that MAGIC Kellis used to always write about when writing about Cardcaptor Sakura episodes? I can’t imagine Japanese streets are that dirty. I walk around in socks a lot and don’t get em dirty too easily. BTW, hi. I’m officially going to use this blog as my guide for getting into shoujo. Maybe it’s just a California thing. If I walk outside in socks, I can expect to be cleaning off dirt from the sidewalk, or black from the street. I wonder if I can’t find some way to add genre to my series list page. While most of what I watch and write about is shoujo, there are definitely a few which aren’t. sakura is seen in different outfits because they are made by tomoyo while capturing a card.But the sword card suddenly appeared so she cant change and she didn’t use the fly card it was jump card ! but that shoe thing is right..